Could Thelonious Monk Win The Jazz Competition Named After Him? : A Blog Supreme The recent announcement of the semifinalists for jazz's most prestigious contest left several musicians at unease. Thus, a debate was launched on the nature of music contests, and with it, perhaps a vision of a future beyond them. Could Thelonious Monk Win The Jazz Competition Named After Him? 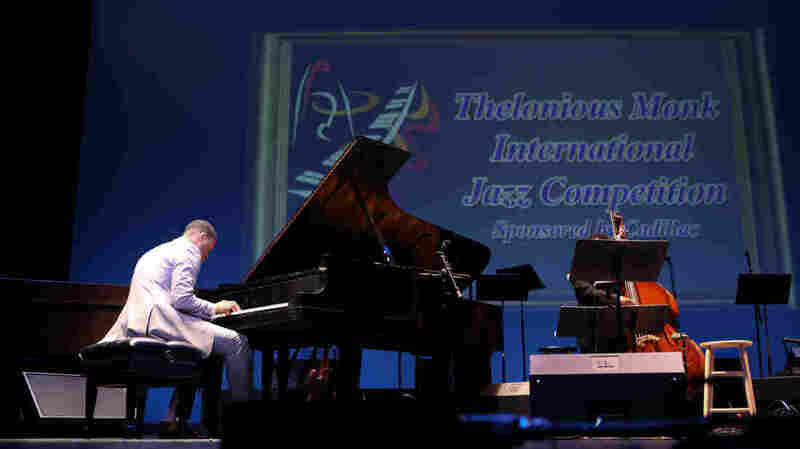 Pianist Kris Bowers performs in the 2011 Thelonious Monk International Jazz Competition. He was later named the winner. Last week, the Thelonious Monk Institute of Jazz announced the 12 semi-finalists for its annual competition for young musicians, often seen as the most prestigious in jazz today. That sparked a rally of Internet responses, notably from pianist Ethan Iverson, who expressed reservations about the "dark side to getting judged for your art." Indeed, Iverson suggested that Monk wouldn't have played "correctly" enough to even qualify for his own competition. The very nature of artistic competitions makes this claim plausible. Because judges of such competitions must seek some criteria for decision-making, and because standard-practice technical skill is an obvious choice for a criterion, "chops" are likely to be emphasized strongly — perhaps at the expense of overall artistic merit. This potentially works against musicians like Thelonious Monk; even though we now consider the a pianist a jazz legend, his remarkably distinct style was not well-received early in his career. But how does this claim hold up to what actually transpires at competitions? Several winners of competitions were quick to declare that they did not betray their artistic visions. Monk wouldn't have won, true, but do you really think judges who are great musicians (Blade?) want to hear "correct"? // it's something I realized early in my competition phase: judges, like most people, just wanna hear good music. // I've seen very talented musicians try to calculate their way into winning (showing prowess in different styles, eg) & fail. // yes, there's a premium on craft in a comp, but the person who's going to win has craft & a strong sense of self.#myExperience // At any rate, I definitely never compromised when I was doing comps back in the day, & I did pretty well (won 3, bought piano) // a comp isn't going to reward a true left-field radical, like Monk, true. But Downbeat didn't dig him either at 1st. Think of // ...comps as just another slightly boring gatekeeper. Radicals have always had to find their own way, comps or no comps. @ethan_iverson yo man, i digg what you're saying - but for the '11 piano MONK, i did pretty well just being myself and playing what i heard. @ethan_iverson Have to continue taking horrible gigs where I was forced to play in ways that felt dishonest as opposed to career gains. 2009: Ben Williams, a popular bass sideman whose own compositions often feature R&B and go-go ideas from his native Washington, D.C. There's not a dud in this bunch, technically speaking, but many are also known for connecting their proficiency to a highly personal, even iconoclastic style. The full list of winners and high finishers, dating back to 1987, is archived online. It's still difficult to see Monk among that list of names, but his chances are certainly better than might be expected. In any event, there is a much larger issue here than hypotheticals about long-dead musicians. Behind "would Monk have won?" is a referendum on the efficacy of jazz competitions. Iverson couched his thoughts in this bigger picture: "Do competitions grow our audience? Do they help innovation? Are schools that train the young to win competitions a vicious cycle?" he asked in a follow-up essay. Certainly, the Monk Competition attracts a certain media buzz. It can be said to support innovation by offering its winners a Concord Jazz record deal — a relatively powerful label with a lot of funding and marketing reach — and $25,000 in scholarship funds, plus $10,000 to second place and $5,000 to third place. The accompanying press attention, networking opportunities and official-looking credential can also open doors. And I can't comment if music schools train their students specifically for competitions, but for a young musician, competitions must sound lucrative: Winning can boost a career with little risk of deflating it. However, these gains come at a price. While friendly, informal "cutting contests" are a huge part of jazz history, formal award competitions are unsettling, at best. The imperative to rank performers is at odds with the premium on self-expression; you wouldn't say Coleman Hawkins was better or worse than Lester Young, but that they were different stylists. And rivalry — at least the kind with actual stakes — is to be discouraged within a field which draws strength from its collaboration and cross-pollination. Even musicians who do well in competitions express doubts about the process. Guitarist Miles Okazaki, who finished second in the 2005 Monk Competition, offered a suggestion on Twitter for improving the format. But he prefaced it by acknowledging, "Given that the singling out of individuals is already antithetical to collective creative music..."
But it's still a competition. It's still exclusive and divisive. If the goal is ultimately pure music and pure experience, competitions should be used — if necessary — as stepping-stones towards something better; they should be set up temporarily to spark interest among music-minded people. After a few years, a dedicated community will hopefully come to realize that competitions impede musical experience. Thus the competition can be eliminated. It's unlikely that the Monk Institute will soon eliminate its sponsor-heavy, star-studded, well-reported centerpiece ceremony. (This year, the accompanying gala honors Madeleine Albright.) To its credit, it can also boast a track record for identifying and supporting high-level, unique talent. But before competitions, there were more working opportunities which accomplished the same things without the inequitable, unpleasant win-lose element. Though his road was long, Monk eventually found mainstream media attention. Perhaps, like Donnelly suggests, we can eventually find "something better"? Instead of a "#jazzolympics," suggests trombonist Jacob Garchik, perhaps the Monk Institute could spend its money on a different enterprise? "[T]hey could start a NYC club devoted to 25 and under artists," he wrote on Twitter. So a new question: How else could we think about redirecting the resources of music competitions to other sorts of career development?